Tom is back with a look at the fourth round of the 2016 AFL Draft. Click here for the second round. Click here for the third round. Click here for the fourth round. The brother of former-Crow and new-Sun Jarryd Lyons has similar strengths to his sibling. In 11 TAC Cup games for the victorious Sandringham Dragons, Lyons averaged almost a goal a game to go with 24 disposals, 4.8 marks, 2.5 tackles and 94 Fantasy points. He is also a clearance machine much like Jarryd. Occasionally his foot skills can be less the perfect but given the Lions lack of depth and likeliness to blood youngsters, expect the Dragons best and fairest to feature at some stage in 2017. 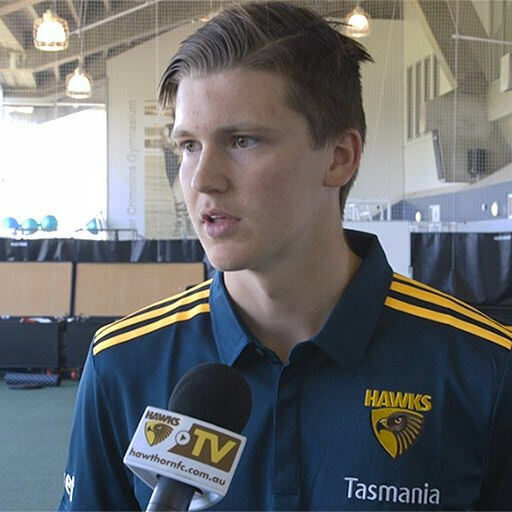 GWS Academy member Ryan Garthwaite has ended up at Punt Road after the Giants elected not to match the Tigers bid. A one-on-one specialist, Garthwaite also reads the play well and is one of the better Fantasy scoring key position players in the draft pool. In 9 games for the Bushrangers, Ryan averaged 77 points thanks to an average of 16 disposals, 6 marks and 3.9 tackles. Has a strange kicking technique but his kicks normally hit the target. Like many of the drafts taller players, Garthwaite will need spend time in the gym but will add depth in his first season. Nick Larkey is a mobile and athletic key position forward. He averaged 0.5 goals and 36 Fantasy points per game for Vic Metro at the National Championships and 65 points for the Oakleigh Chargers. Played as a tall forward in 2016 but I can see him adding depth to the Kangaroos squad at both ends. Very light at the moment so don’t expect him to play next year. The Hawks lost Brad Hill in the trade period but have gained another outside midfielder in Harry Morrison. Although Morrison doesn’t have the line-breaking pace of Hill (as shown by a 3.10 second 20-metre sprint time), he is a quality kick who shows composure with ball in hand and makes good decisions. The Hawks had to wait a long time for their first selection but will be happy with Morrison. Impressed in the standing vertical jump, goalkicking test and beep test at the national combine and was a late inclusion in the all-star match. After missing out on selection last year, like fellow New South Welshman Lachlan Tiziani, Ben Davis returned to the NSW/ACT Rams Under-18 team as an overeager and impressed. He was selected in the Allies team and finished the championships with an average of 2 goals and 65 Fantasy points per game to win the Rams leading goalkicker. Davis is a good set-shot, capable overhead and will bring x-factor to West Lakes. Davis is ready to play straight away but breaking into the star-studded Adelaide forward line will be tough. Every draft has its stories. This story is one of the strangest. After Hawthorn offloaded veteran stars Sam Mitchell and Jordan Lewis in the trade period, they picked up Harry Morrison with pick 74 and a tall forward by the name of… Mitchell Lewis with 76. So they’ve replaced Mitchell and Lewis with Mitchell Lewis, a 198cm key forward with strong hands overhead, athleticism and competitiveness. Played up forward for the Cannons but can pinch-hit in the ruck. Will add key position depth and is physically ready for AFL. They say once your drafted, the pick is just a number. At least that’s the mantra West Coast father/son Jake Waterman will stand by. The sun of double premiership Eagles Chirs Waterman, Jake is a marking medium forward with speed and competitiveness. Despite being inconsistent, Waterman averaged a goal a game and 63 points for WA at the Championships. A member of the AFL Academy, Waterman was best on ground for Claremont in the WAFL Grand Final and also played in the All-Stars clash.